Option Pricing Models and the "Greeks"
Both models are based on the same theoretical foundations and assumptions (such as the geometric Brownian motion theory of stock price behaviour and risk-neutral valuation). However, there are also some some important differences between the two models and these are highlighted below. Finance Add-in for Excel: Option pricing functions. Options Analysis Software: Tools for options strategy evaluation and more. On-line Calculators: Option valuation and probability calculations. The Black-Scholes model is used to calculate a theoretical call price (ignoring dividends paid during the life of the option) using the five key determinants of an option's price: stock price, strike price, volatility, time to expiration, and short-term (risk free) interest rate. v = annual volatility of stock price (the standard deviation of the short-term returns over one year). See below for how to estimate volatility. Lognormal distribution -- but how realistic? The model is based on a normal distribution of underlying asset returns which is the same thing as saying that the underlying asset prices themselves are lognormally distributed. A lognormal distribution has a longer right tail compared with a normal, or bell-shaped, distribution. The lognormal distribution allows for a stock price distribution of between zero and infinity (ie no negative prices) and has an upward bias (representing the fact that a stock price can only drop 100% but can rise by more than 100%). In practice underlying asset price distributions often depart significantly from the lognormal. For example historical distributions of underlying asset returns often have fatter left and right tails than a normal distribution indicating that dramatic market moves occur with greater frequency than would be predicted by a normal distribution of returns-- ie more very high returns and more very low returns. A corollary of this is the volatility smile -- the way in which at-the-money options often have a lower volatility than deeply out-of- the-money options or deeply in-the- money options. Modified Black-Scholes and binomial pricing (using implied binomial trees) for European and American option pricing with non-lognormal distributions. These models can be used to see the impact on option prices of non-lognormal price distributions (as measured by coefficents of skewness (symmetry) and kurtosis (fatness of distribution tails and height of peaks)), and to calculate and plot the volatility smile implied by these distributions. Measuring the degree to which historical asset price distributions diverge from the lognormal (as measured by coefficents of skewness and kurtosis). Plotting non-lognormal distribution curves for specified coefficients of skewness and Kurtosis (as well as volatility etc) to see how they differ from the lognormal. In addition to using the add-in you can use the on-line stock price distribution calculator to examine the sensitivity of the shape of the lognormal stock price distribution curve to changes in time, volatility, and expected growth rates. And you can also use the on-line stock price probability calculator to look at the probabilities of stock prices exceeding upper and lower boundary prices -- both at the end of a specified number of days and at any time during the period. Volatility -- implied or historical? This is the most critical parameter for option pricing -- option prices are very sensitive to changes in volatility. Volatility however cannot be directly observed and must be estimated. Whilst implied volatility -- the volatility of the option implied by current market prices -- is commonly used the argument that this is the "best" estimate is somewhat circular. Skilled options traders will not rely solely on implied volatility but will look behind the estimates to see whether or not they are higher or lower than you would expect from historical and current volatilities, and hence whether options are more expensive or cheaper than perhaps they should be. It's a slight over simplification, but basically implied volatility will give you the price of an option; historical volatility will give you an indication of its value. It's important to understand both. For instance, if your forecast of volatility based on historical prices is greater than current implied volatility (options under valued) you might want to buy a straddle; if your historical forecast is less than implied volatility you might want to sell a straddle. Implied volatility calculation (American and European options, with and without dividends). Equally weighted historical volatility estimation using historical prices: one or more of high-low, closing, and open prices. All the price data required are available at no charge at sites such as Yahoo. Exponentially weighted historical volatility estimation using the EWMA (exponentially weighted moving average) model or the GARCH model. These models give greater emphasis to more recent prices. Volatility forecasting using the GARCH model, which lets you see how volatility is likely to move in the future. A common application of this is to create volatility term structures for the weeks or months ahead to answer questions like "what volatility should I use for pricing an option with a life of three months?". The implied volatility, historical volatility, and forecast volatility tools are complementary. With volatility being such a critical factor a good options trader will use all three sets of tools to help form a view about the volatility to use in pricing options. See the Finance Add-in for Excel and Volatility FAQs pages, Historic Volatility Calculator page, Implied Volatility Calculator page, and the on-line demos for more information. Risk-neutral valuation -- does the expected stock return matter? Unlike volatility, which is all important for determining the fair value of an option, views about the future direction of an underlying asset (ie whether you think it will go up or down in the future and by how much) are completely irrelevant. Significantly, the expected rate of return of the stock (which would incorporate risk preferences of investors as an equity risk premium) is not one of the variables in the Black-Scholes model (or any other model for option valuation). The important implication is that the value of an option is completely independent of the expected growth of the underlying asset (and is therefore risk neutral). Thus, while any two investors may strongly disagree on the rate of return they expect on a stock they will, given agreement to the assumptions of volatility and the risk free rate, always agree on the fair value of the option on that underlying asset. Putting it another way, whether the stock price rises or falls after, eg, writing a call, it will always cost the same (providing volatility remains constant) to dynamically hedge the call and this cost, when discounted back to present value at the risk free rate, is very close to the Black-Scholes value. Which is hardly surprising given that the Black-Scholes price is nothing more than the amount an option writer would require as compensation for writing a call and completely hedging the risk. The important point is that the hedger's view about future stock prices is irrelevant. This key concept underlying the valuation of all derivatives -- that fact that the price of an option is independent of the risk preferences of investors -- is called risk-neutral valuation. It means that all derivatives can be valued by assuming that the return from their underlying assets is the risk free rate. Advantage: The main advantage of the Black-Scholes model is speed -- it lets you calculate a very large number of option prices in a very short time. Limitation: The Black-Scholes model has one major limitation: it cannot be used to accurately price options with an American-style exercise as it only calculates the option price at one point in time -- at expiration. It does not consider the steps along the way where there could be the possibility of early exercise of an American option. As all exchange traded equity options have American-style exercise (ie they can be exercised at any time as opposed to European options which can only be exercised at expiration) this is a significant limitation. The exception to this is an American call on a non-dividend paying asset. In this case the call is always worth the same as its European equivalent as there is never any advantage in exercising early. Various adjustments are sometimes made to the Black-Scholes price to enable it to approximate American option prices (eg the Fischer Black Pseudo-American method) but these only work well within certain limits and they don't really work well for puts. The binomial model breaks down the time to expiration into potentially a very large number of time intervals, or steps. A tree of stock prices is initially produced working forward from the present to expiration. At each step it is assumed that the stock price will move up or down by an amount calculated using volatility and time to expiration. This produces a binomial distribution, or recombining tree, of underlying stock prices. The tree represents all the possible paths that the stock price could take during the life of the option. At the end of the tree -- ie at expiration of the option -- all the terminal option prices for each of the final possible stock prices are known as they simply equal their intrinsic values. Next the option prices at each step of the tree are calculated working back from expiration to the present. The option prices at each step are used to derive the option prices at the next step of the tree using risk neutral valuation based on the probabilities of the stock prices moving up or down, the risk free rate and the time interval of each step. Any adjustments to stock prices (at an ex-dividend date) or option prices (as a result of early exercise of American options) are worked into the calculations at the required point in time. At the top of the tree you are left with one option price. To get a feel for how the binomial model works you can use the on-line binomial tree calculators: either using the original Cox, Ross, & Rubinstein tree or the equal probabilities tree, which produces equally accurate results while overcoming some of the limitations of the C-R-R model. The calculators let you calculate European or American option prices and display graphically the tree structure used in the calculation. Dividends can be specified as being discrete or as an annual yield, and points at which early exercise is assumed for American options are highlighted. Advantage: The big advantage the binomial model has over the Black-Scholes model is that it can be used to accurately price American options. This is because with the binomial model it's possible to check at every point in an option's life (ie at every step of the binomial tree) for the possibility of early exercise (eg where, due to eg a dividend, or a put being deeply in the money the option price at that point is less than its intrinsic value). Where an early exercise point is found it is assumed that the option holder would elect to exercise, and the option price can be adjusted to equal the intrinsic value at that point. This then flows into the calculations higher up the tree and so on. The on-line binomial tree graphical option calculator highlights those points in the tree structure where early exercise would have have caused an American price to differ from a European price. The binomial model basically solves the same equation, using a computational procedure that the Black-Scholes model solves using an analytic approach and in doing so provides opportunities along the way to check for early exercise for American options. Limitation: The main limitation of the binomial model is its relatively slow speed. It's great for half a dozen calculations at a time but even with today's fastest PCs it's not a practical solution for the calculation of thousands of prices in a few seconds. The same underlying assumptions regarding stock prices underpin both the binomial and Black-Scholes models: that stock prices follow a stochastic process described by geometric brownian motion. As a result, for European options, the binomial model converges on the Black-Scholes formula as the number of binomial calculation steps increases. In fact the Black-Scholes model for European options is really a special case of the binomial model where the number of binomial steps is infinite. In other words, the binomial model provides discrete approximations to the continuous process underlying the Black-Scholes model. Whilst the Cox, Ross & Rubinstein binomial model and the Black-Scholes model ultimately converge as the number of time steps gets infinitely large and the length of each step gets infinitesimally small this convergence, except for at-the-money options, is anything but smooth or uniform. To examine the way in which the two models converge see the on-line Black-Scholes/Binomial convergence analysis calculator. This lets you examine graphically how convergence changes as the number of steps in the binomial calculation increases as well as the impact on convergence of changes to the strike price, stock price, time to expiration, volatility and risk free interest rate. For rapid calculation of a large number of prices, analytic models, like Black-Scholes, are the only practical option on even the fastest PCs. However, the pricing of American options (other than calls on non-dividend paying assets) using analytic models is more difficult than for European options. Roll, Geske and Whaley analytic solution: The RGW formula can be used for pricing an American call on a stock paying discrete dividends. Because it is an analytic solution it is relatively fast. Black's approximation for American calls: Although the RGW formula is an analytic solution it involves solving equations iteratively and thus it is slower than Black-Scholes. Black's approximation basically involves using the Black-Scholes model after making adjustments to the stock price and expiration date to take account of early exercise. Barone-Adesi and Whaley quadratic approximation: An analytic solution for American puts and calls paying a continuous dividend. Like the RGW formula it involves solving equations iteratively so whilst it is much faster than the binomial model it is still much slower than Black-Scholes. A by-product of the Black-Scholes model is the calculation of the delta: the degree to which an option price will move given a small change in the underlying stock price. For example, an option with a delta of 0.5 will move half a cent for every full cent movement in the underlying stock. A deeply out-of-the-money call will have a delta very close to zero; a deeply in-the-money call will have a delta very close to 1. Call deltas are positive; put deltas are negative, reflecting the fact that the put option price and the underlying stock price are inversely related. The put delta equals the call delta - 1. The delta is often called the hedge ratio: If you have a portfolio short n options (eg you have written n calls) then n multiplied by the delta gives you the number of shares (ie units of the underlying) you would need to create a riskless position - ie a portfolio which would be worth the same whether the stock price rose by a very small amount or fell by a very small amount. In such a "delta neutral" portfolio any gain in the value of the shares held due to a rise in the share price would be exactly offset by a loss on the value of the calls written, and vice versa. Note that as the delta changes with the stock price and time to expiration the number of shares would need to be continually adjusted to maintain the hedge. How quickly the delta changes with the stock price is given by gamma (see "Greeks" below). The Options Strategy Evaluation Tool, which can be downloaded from this site, calculates and displays the delta for each individual option trade entered into the tool. If you set up a covered call in the Options Strategy Evaluation Tool using Black-Scholes European pricing (ie sell n calls and buy n underlying shares) then change the number of shares bought to be equal to the number of options multiplied by the delta you will have an example of a hedged position. Notice how the time line (ie the curved line showing the profit at the number of days to expiration) on the payoff diagram just touches (but doesn't pass through) the horizontal axis at one point only: the point equal to the current share price. Moving a short distance in either direction on this line will have the same impact on profit. ie you are delta hedged. The Options Strategy Evaluation Tool also calculates the position delta for a range of stock prices and days to expiration -- that is, the delta of the entire strategy consisting of multiple option trades and trades in the underlying stock. The position delta, sometimes called the Equivalent Stock Position (ESP) lets you see, for example, how a dollar rise in the underlying stock prices will affect the overall profitability of the entire strategy. For example, if the ESP of a portfolio, or strategy, is -2,300 it means that the market exposure of the portfolio is equivalent to a portfolio short 2,300 shares. Thus a one dollar rise in the stock price will cause the profitability of the entire position to fall by $2,300. The other position "Greeks" are also calculated by the model as well -- see below. You can also see how the delta changes with stock price, volatility, time to expiration and interest rate by using the on-line options calculator. Gamma: It measures how fast the delta changes for small changes in the underlying stock price. ie the delta of the delta. If you are hedging a portfolio using the delta-hedge technique described under "Delta", then you will want to keep gamma as small as possible as the smaller it is the less often you will have to adjust the hedge to maintain a delta neutral position. If gamma is too large a small change in stock price could wreck your hedge. Adjusting gamma, however, can be tricky and is generally done using options -- unlike delta, it can't be done by buying or selling the underlying asset as the gamma of the underlying asset is, by definition, always zero so more or less of it won't affect the gamma of the total portfolio. Vega: The change in option price given a one percentage point change in volatility. Like delta and gamma, vega is also used for hedging. Theta: The change in option price given a one day decrease in time to expiration. Basically a measure of time decay. Unless you and your portfolio are travelling at close to the speed of light the passage of time is constant and inexorable. Thus hedging a portfolio against time decay, the effects of which are completely predictable, would be pointless. Rho: The change in option price given a one percentage point change in the risk-free interest rate. 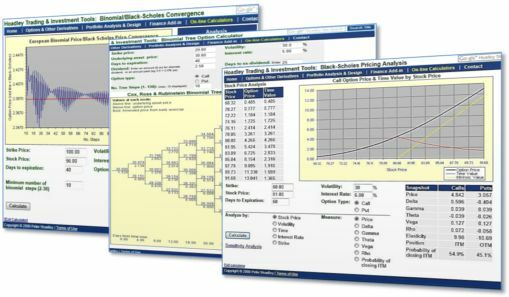 The on-line Black-Scholes calculator calculates these derived measures for each set of variables submitted for calculation. Like delta, these "Greeks" vary with changes in each of the underlying Black-Scholes variables. eg the gamma varies as the volatility changes. You can see graphically how each derived measure changes as the underlying Black-Scholes variables change. The Options Strategy Evaluation Tool calculates the position "Greeks" -- ie the "Greeks" for individual option and stock trades and for the entire strategy or portfolio (ie net position "Greeks"). This lets you see how the profitability of the strategy is impacted by changes to stock price, time to expiration, volatility etc. All the "Greeks" can be viewed graphically thereby highlighting how they change with changes in the underlying asset and with time. The Options Strategy Evaluation Tool contains an automatic position hedging feature that lets you achieve target neutrality outcomes with respect to delta, delta and gamma, vega, delta and vega, or delta, gamma, and vega. Finally the Finance Add-in for Excel available from this site contains a position hedging function that not only lets you achieve neutrality in key combinations of the "Greeks" but also lets you specify specific positive or negative targets for individual "Greeks" and combinations of the "Greeks".